He is loved by many, loathed by some but few will deny the power of his word. It is infectious! On Saturday, Dr Mensa Otabil Founder of the International Central Gospel Church infected and provoked a mass of young entrepreneurs with yet another signature performance, a destiny changing motivational message that will linger in the minds of many, for many years to come. He was to give a keynote address at Albert Ocran's springboard convocation programme, but he did far more than that. He planted, watered and nurtured a seed of holy anger in the army of entrepreneurs, hoping that anger will eventually germinate into fruits that will reverse the backwardly suffocating systems, laws and policies in Ghana; systems that served only to frustrate and kill as many dreams and businesses as possible. (a moving pavement for transporting pedestrians, as in a shopping precinct or an airport) to tell the great but annoying story of why Mark Zuckerberg, a 31 year old computer programmer, is richer than him (Otabil), his wife; richer than president Mahama and the MPs and richer than all Ghanaians combined. Otabil feels angry and insulted by the development because Zuckerberg, he reckoned, is not any more intelligent than the thousands of computer programmers in Ghana but the American has a better environment; a country of opportunities. "What is the difference between Zuckerberg and you; Steve Jobs and you? Otabil asked rhetorically. "It is not brains, it is the environment," he answered sullenly. Where is our travolator and sulfur-free onion? The preacher man told a story of how he travelled out of the country and with the aid of a travolator he beat a young man to a walking contest. The man decided to speedwalk but used a travolator at some point. Even though the man heeled-and-toed with agility he could not beat Otabil because the travolator pushed him faster to his destination. He told another story, he read in a book, of a US company seeking to grow onions that will not sting the eyes. For a man who had shed onion-stinging- tears in the past from his kitchen in Accra, he will certainly wonder how an American company will grow new species of onions without its notorious characteristic. But the 'useless' book he was reading in the plane suddenly became useful, revealing, that the new species of onions will be planted in a "non-sulfuric ground." He learnt a new thing. Onions sting eyes because they are always grown and nurtured in a soil full of sulfur but the US company is coming with a new offer. "The reason why the onions will not sting people's eyes is because it was going to be grown in sulfur free soil." "It is not the nature of onions to sting eyes. It is the environment it is nurtured in that makes it sting eyes. 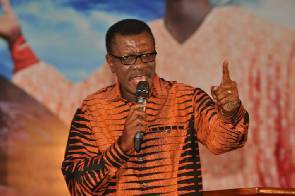 "It struck me that a person can be so good but if he is planted in a wrong environment, he is going to turn up so bad," Otabil said. He wondered how much sulfur was in the Ghanaian environment that made many dreams, business break down in tears. "What have we put in the environment, in the soil that is killing the dream of young men and young women. How can people go to university and for years and not know what to do? How can people with potential not fulfill their potential? "If you take a simple area like football, the greatest Ghanaian players now were all onions that were planted in a different soil. They had to go outside Ghana for their talents to become world class. Do you think if Michael Essien had continued playing in the Ghana league we will call his name? No! Is he talented? Yes. No matter how big the dream is, Otabil says if the environment is without a travolator or a sulfur free soil, you will achieve something but ultimately you will become the village champion amongst global players. "The challenge for nations like Ghana is not the challenge of talented citizens. It is the challenge of poisonous environment. An environment that has been poisoned by ordinariness, by mediocrity and sometimes by a clear agenda to destroy talents. "And how can a nation be great when its systems are fighting the talent of its people? he asked. It is good to dream because dream is free but fight to get a better environment for the dream to thrive, he challenged the young men and women. "We have to force the politicians to start thinking of us; of our lives; our future and dreams. And the only way to do that is for you to start thinking not in party terms but in policy terms,"
"Because if that doesn't happen dreamers will die with their dreams not realised," he added. What is your dream; fight for a better travolator and a sulfuric free soil, to make your dreams come to pass.